Here’s a bit of what Joseph’s been up to: He finally got the guts to let go of the furniture and walk on his own, and now we can’t get him to stop! He’s getting used to wearing shoes (it helps that we were able to find him a really cool pair of Spiderman shoes), and loves walking everywhere. 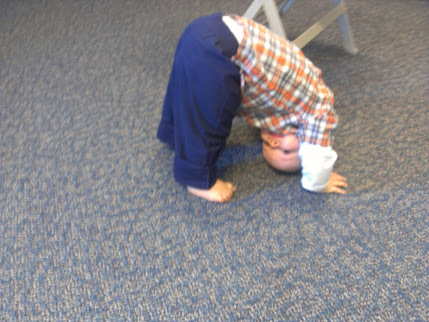 He also has discovered how to do his own version of a headstand (puts his head and hands on the floor and then straightens his arms and legs). It’s rather entertaining to watch him. Life must be much more interesting upside-down. 🙂 Another thing he’s discovered is the concept of the camera (or in this case, our phones). Whenever one of us pulls out our phone to take a picture of some ridiculously cute thing that he’s doing, he’ll stop and give a REALLY cheesy grin (eyes squeezed shut and everything). Or, he’ll roar at the camera…he’s really into roaring/growling right now. He’s becoming so much more interactive with us, it’s amazing! He loves to go to the park and play on the swings and slide, and loves to go anywhere with us, really. It’s hard to believe that in four short months, he’ll be ready to go to nursery (though if it were up to him, he’d go right now…he LOVES playing with other kids). Time seems to be just flying by!